S’mores just might be my favorite dessert, though competition is stiff! I love the graham cracker – marshmallow – chocolate triad though, in any form. And these cupcakes are a pretty amazing form: vanilla cupcakes, studded with graham crackers, stuffed with marshmallow creme, and topped with thick chocolate frosting. The recipe looks long, but I promise it is easy! Note – filling and frosting can be prepared while cupcakes bake and cool. I split the directions up for those who would prefer to prepare the components separately. Preheat oven to 350 degrees F. Line muffin pans with 15 liners. Place graham crackers in a baggie and use a rolling-pin or a sturdy cup to crush them into a homogenous mixture with a rough sand texture. Stir together flour and baking powder in a small bowl. In a medium bowl, cream together sugar and butter. Beat in eggs, one at a time. Then stir in vanilla. Working in batches, mix flour mixture into wet ingredients. Stir in milk, then fold in crumbled graham crackers. Spoon batter into cupcake pan, filling each liner about 3/4. Bake 20minutes, until tops of cupcakes spring back to the touch. Set aside to cool. 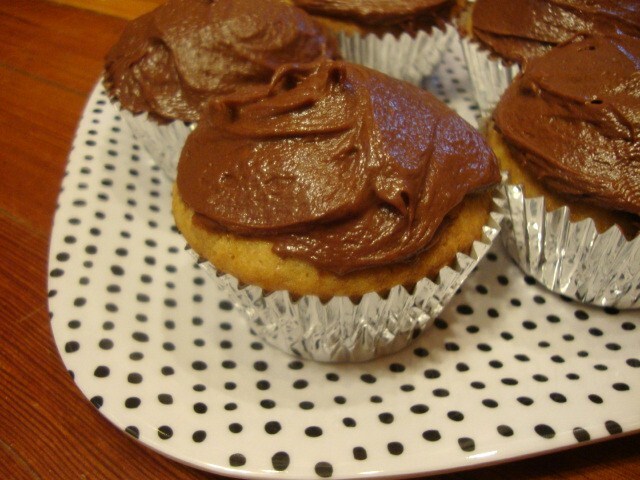 Cooling can be sped up by placing baked cupcakes into the freezer for 1-2minutes. Place sugar and water in a medium pan over medium-high heat. Cook, stirring constantly, until sugar has completely liquified. Remove from heat. Place egg white, vanilla, and cream of tartar in a **clean and dry** bowl. Beat until soft peaks begin to form. A stand mixer would be preferable, but I’ve definitely done this using a handheld mixer and lots of patience. While mixer is running, carefully stream sugar syrup into bowl. Beat, scraping down the sides of the bowl as needed, until stiff peaks form and mixture is glossy; 7minutes. Place chocolate chips in a microwave safe bowl. Melt, microwaving for 30second intervals and stirring in between. You want to stop heating when the chips are mostly melted, as they will continue to melt as you stir. This step can also be done in a double boiler. In a medium bowl, cream together butter, cream cheese, and sugar. Pour melted chocolate – it only needs to cool for a moment or two – into frosting. Beat, scraping down the sides of the bowl, until the mixture is incorporated. Lay cooled cupcakes on a flat surface. Using a paring knife, carefully cut a small, cone-shaped hole in the center of each cupcaking. Take care not to cut through the bottom of the cupcake. Use a spatula to transfer filling to a pastry bag fitted with a medium piping tip. A plastic bag with the corner will work as well, but be carefull not to cut the hole too large or the pressure will force out the piping tip. Pipe filling into the holes you’ve created. Perfect! You linked to this for me on Jenna’s blog. Thank you! I will be making these soon.